Out now on DVD and Blu-Ray is Cold in July, is a thrilling throwback to the violent crime films of the 70’s and 80’s. Starring an excellent Michael C. Hall, a gruff Sam Shepard and an extremely memorable Don Johnson, is Cold in July worth your time? The film begins with Hall’s Richard Dane waking up to an intruder in his house. Thanks to an accidental finger slip the intruder winds up dead with a bullet through his eye. It’s chalked up to self-defence and he gets away with it, until the dead intruder’s father (Sam Shepard) comes looking for revenge. The film then takes off at full tilt, shifting between genres until the surprising finale. There are hints that things aren’t as simple as they appear from the premise and the film quickly enters really dark territory. Set in a backwater town in America where it seems everybody really does know each other, Cold in July can be bleak. But it can also be darkly comic and is always entertaining. The plot moves fast and there are plenty of twists, turns and unanswered questions. In a lesser film it may all be a bit much, but Cold in July is directly deftly and very stylishly by Jim Mickle and features three really terrific performances. It’s these performances from the film’s three leads that really makes the film standout. Michael C. Hall is believable as the everyman trying his hardest to protect his family. You can tell this isn’t a world he’s used to and it makes him an affecting protagonist. Sam Shepard is scary as the angry father but becomes a sympathetic character as the film gathers pace. The real remarkable performance however is Don Johnson. Famous for playing Sonny Crockett in the awesome 80’s series Miami Vice, Johnson is very clearly having fun in the role of Jim Bob Luke, a private investigator. It’s really great seeing Johnson back in films and he will no doubt be your favourite character in this. Charming, funny and pretty kickass. See the clip below for proof. Cold in July is set in 1989 and it sure feels like it. The fashion, the decor, the music and the cars are all out of the 80’s. The synth soundtrack is just awesome, similar to those heard in Drive or recently in The Guest. The characters look like they’re straight out of the 80’s too. Michael C. Hall sports an impressive mullet and moustache combination and Don Johnson’s shirts are suitably outlandish, matching his cowboy hat and his car. Perhaps a problem with Cold in July is that by having so many twists and turns, and by having so many plot threads being picked up and dropped, it leads to a few loose ends. This will change your opinion on the film depending on how satisfying you like your films to be. Personally I don’t mind. If the character just never finds something out, perhaps we as an audience shouldn’t either. 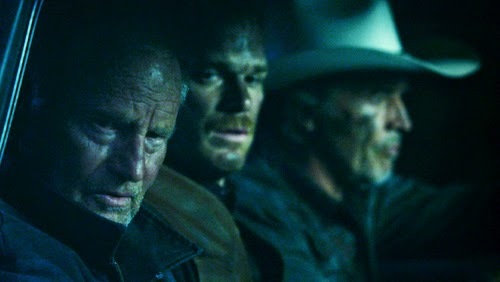 Overall Cold in July works very well as a dark noir-ish thriller with an exceptionally awesome synth soundtrack. The performances are just outstanding, Don Johnson in particular. It’s directed with real style and flair and it is completely worth your time. It may not be 100% satisfying, but what it does it does extremely well. Cold in July is for people who like their thrillers with a dark but entertaining edge (and fans of Miami Vice!) It gets 5/5.